Canada is many things to me: A place we used to visit every summer when my dad was stationed at Great Lakes Naval Training Station oh so many years ago. 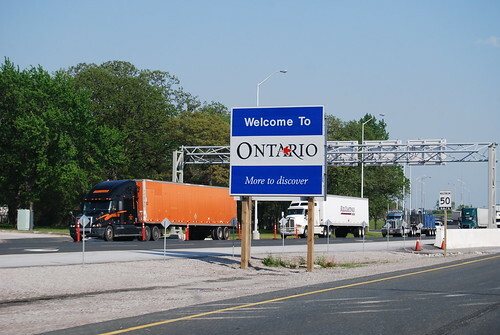 Many adolescent road trips to extended family in Ontario. The land of maple syrup and Canadian bacon. And just recently, a place of many food discoveries. I’ve been trying to keep straight in my mind all the trips I’ve taken over the last month. The trip to Canada was actually appended onto a trip to the Midwest for my brother’s wedding. Canada was a last-minute suggestion from my mom to visit relatives in St. Catherine’s, Ontario — a suburb an hour outside of Toronto. Between the rush of getting our passports renewed and our most recent trip for our anniversary, Canada was a nice diversion. Although the majority of it was visiting family– specifically cousins I haven’t seen in years– I enjoyed exploring more of the city since my last visit which only lasted a few hours. 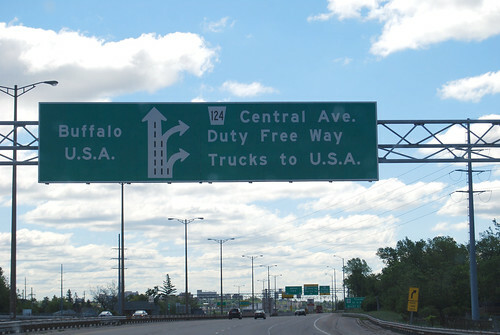 The experience with driving into Canada through Port Huron, Mich., was experience. For one, the huge sign warning drivers to go no faster than 80 km an hour (converted to 49.7 miles per an hour for us on the metric system). Apparently, that’s only reserved for Americans (according to my uncle). Wayne Gretzky winery? Totally legit wine. And the food trucks selling french fries and other foods by the side of the road? They’re affectionally call chip wagons by the locals. 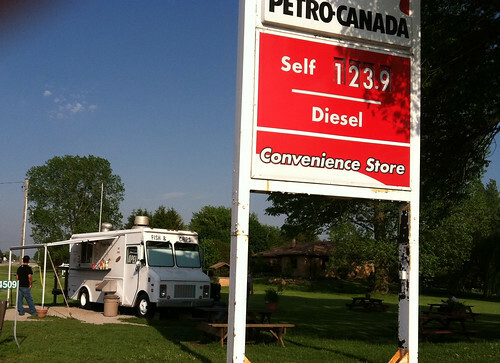 We saw our first chip wagon a few miles inside of Ontario during a necessary fill-up, sitting by the side of the petrol station. 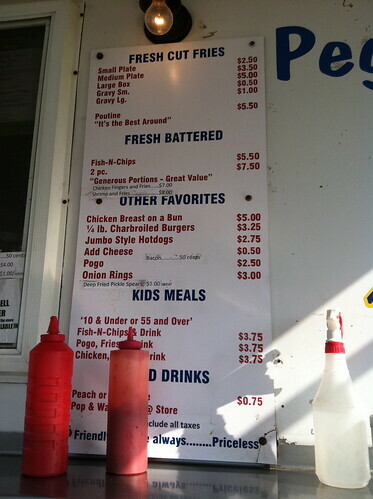 Peggy Sue’s chip wagon sold more than fish ‘n chips— chicken sandwiches, hot dogs, onion rings and pogos. Pogos? According to the woman, a pogo is— and this is verbatim— “a hot dog with a stick through it that’s battered and fried.” When I asked if I was a corndog, her entire face lit up realizing that I knew what it was. While I didn’t order the pogo, I did order the poutine with a side order of fish ‘n chips. It seems like poutine is big this year; a few places in San Diego even serve it. 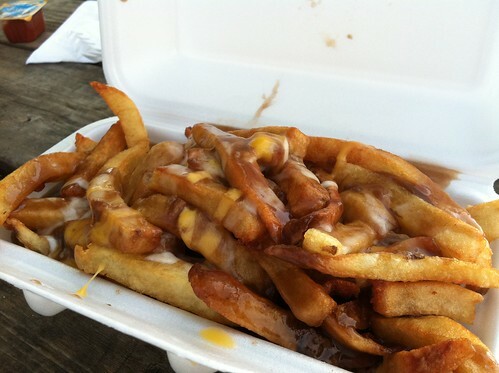 For the uninitiated, it’s french fries topped with curds and gravy. Didn’t you know that it’s one of Canada’s national treasures? While it’s one of the few times I’ve had poutine in my life, it was deliciously filling especially for the road weary. And the sweltering 30 degrees C (86 degrees F), didn’t deter me from finishing the hot mopping mess of gravy after the fries were gone. 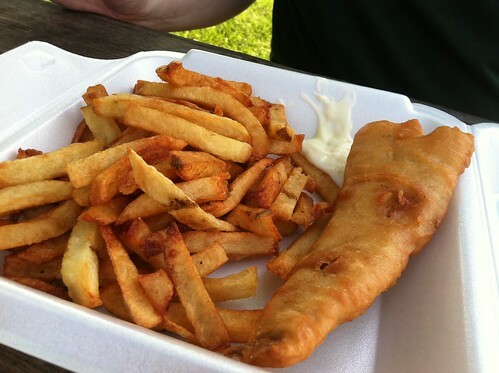 The fish ‘n chips were nothing to scoff at either. It was served with tartar sauce, and if you wanted some malt vinegar, it was available in a squirt bottle right by the ordering window. While the rest of the trip was broken up with multiple visits to Tim Horton’s, a visit to the grocery store to show Paul milk in plastic bags and my first taste of Vegemite, Canada offers so much more than Niagara Falls. I can’t wait to return. I went to Montreal when I was in college and I remember listening to the radio there and hearing so many people say “eh” after their sentences and it cracked me up. I’d like to visit another part of Canada someday! I’ve never been to Montreal but it’s on my list! And my Canadian cousins end their sentences with “eh” quite frequently too. Hi Darlene – I like how you spelled “Niagara” like “Viagra”! : ) Great shot of the Falls too! Well, the top part. Oops! Typo corrected. We didn’t walk down to the bottom to see the entire falls because it was SO COLD. I think there are more Tim Hortons in Canada than there are McDonalds. You know how when you learn a new word, you start to see it everywhere? I learned about poutine about a month ago, and I keep hearing about it! Once at a little fry shop in Boston, once on South Park, and now on your blog! One of these days I will have to try it. In Boston too? If you like french fries and you like gravy, then I’m sure you’ll like poutine. Congrats to your brother!!! What a fun trip, especially with good food involved. 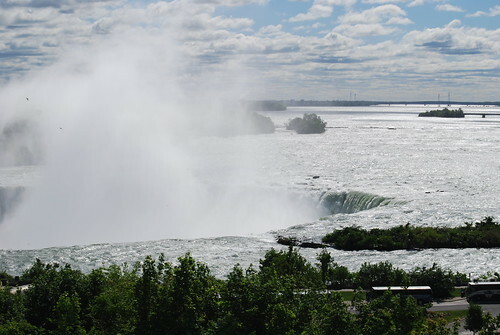 We’re taking the boys to see the falls and visit my grandpa in Toronto. We’ll be sure to hit as many Tim Hortons as we can, look for some good Chinese food, especially to find the oh-so-junky Chicken Balls — fried pieces of battered boneless chicken meat that ends up in the shape of balls. Thanks, Hannah! I didn’t know you had a grandfather in Toronto. The traffic was horrible driving in and out–so much worse than L.A. if you can believe it. I visited Ottawa and Toronto 10 years ago and Ioved it. I have yet to visit again but I’m definelty going to check out some of the San Diego spots that have Poutine. It’s been way too long since the last time I had it. I also found your blog via Erin. It’s great to find a San Diego based food blog. Thanks, Stephanie. Ten years is too long to not visit Ottawa or Toronto. Did you notice the road signs for the O.P.P.? They crack me up every time. My friend from Ontario, not so amused. I didn’t realize there was such a rivalry between Timothy Horton’s and Dunkin’ Donuts! I believe I missed the signs for O.P.P. Hilarious! I live 20 minutes from Port Huron. There is a ferry down by here to cross into Canada. Much more scenic and beautiful. Maybe next time! Port Huron just isn’t what it used to be.